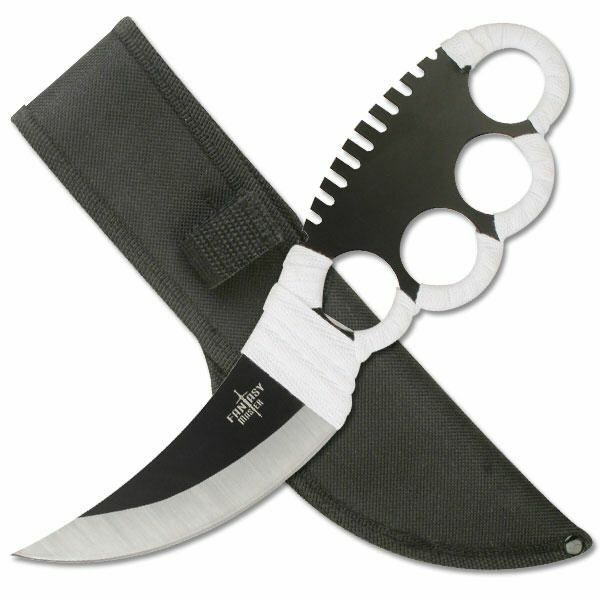 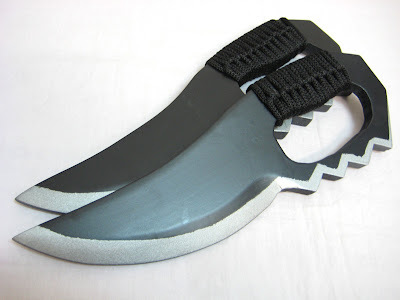 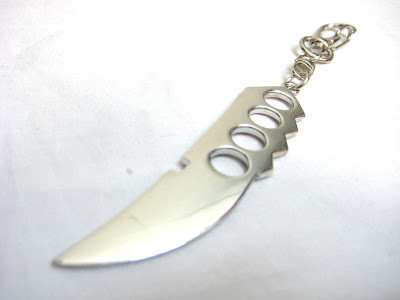 A Trench knife is a combat knife designed to kill or gravely incapacitate an enemy soldier at close quarters, as might be encountered in a trenchline or other confined area.It was developed in response to a need for a close combat weapon for soldiers conducting assaults and raids on enemy trenchlines during the First World War. 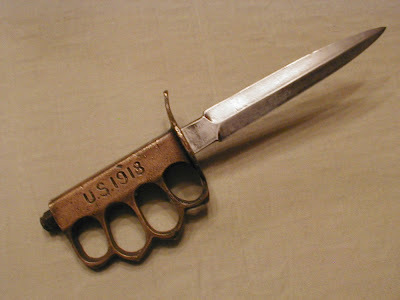 An example of a World War I trench knife is the German Army's Nahkampfmesser (close combat knife). 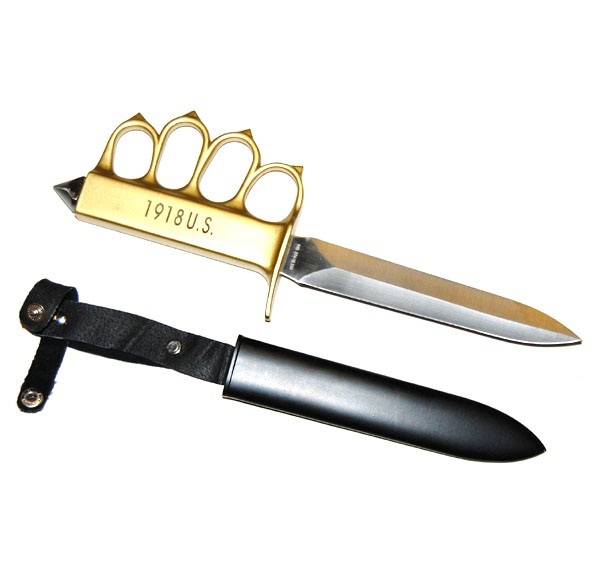 With the outbreak of the Second World War, the trench knife, by this time usually referred to as a combat knife, proved so useful that armies continued to develop and issue new designs. 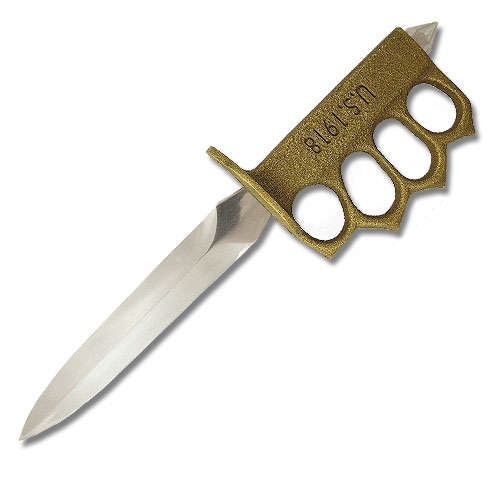 On the Axis side, the Nahkampfmesser and designs developed from it were again widely issued to the ordinary soldier as general-purpose fighting and utility knives, while Allied armies generally restricted issue of trench knives to elite infantry units and infantry not otherwise equipped with the bayonet. 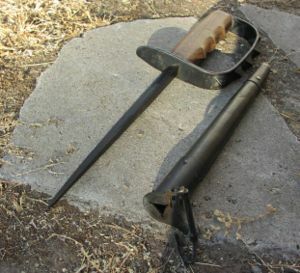 With the exception of the German Nahkampfmesser (combat knife), most early trench knives were fabricated by hand by individual soldiers or ordnance blacksmiths for the purpose of silently eliminating sentries and other enemy personnel during trench raids.These early "trench knives" were often nothing more than shortened and sharpened Army-issue bayonets. 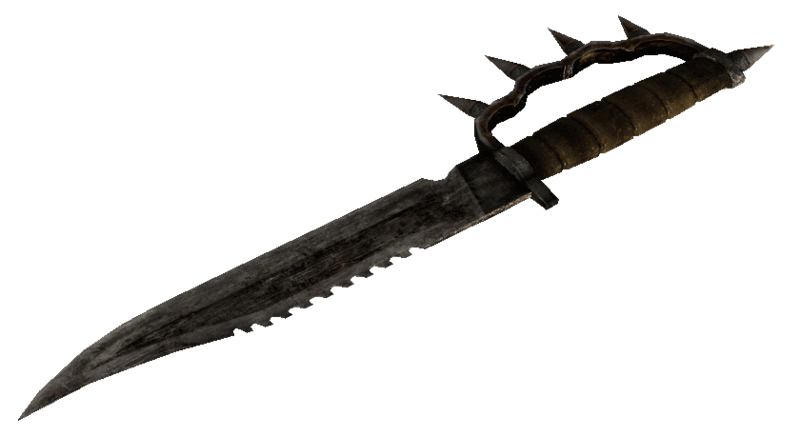 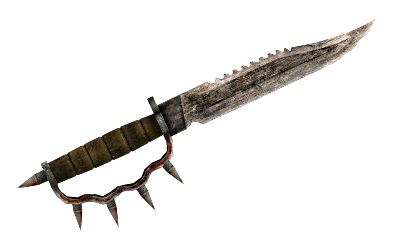 One type of stabbing weapon, the French Nail, was made by cutting and pointing the steel stakes used to support the ubiquitous barbed wire protecting the trench lines. 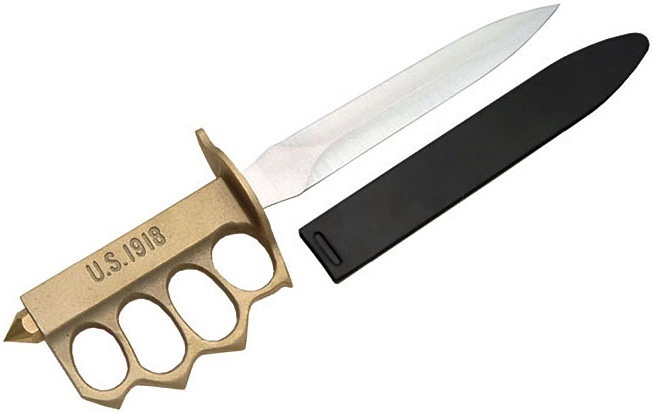 All trench knives share one common characteristic: they were designed specifically for military use in close combat encounters with enemy personnel. Some historians say that some trench knives models were inspired by the Bowie knife for its design. 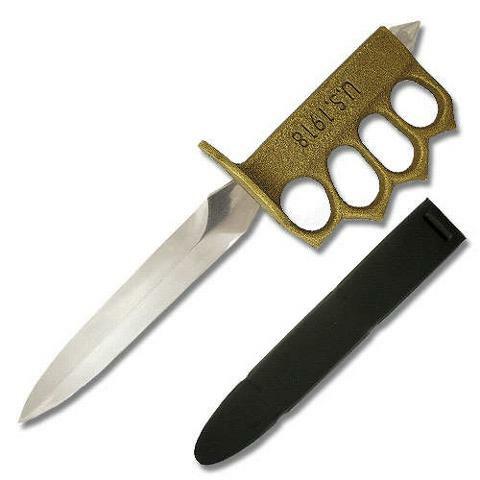 The German Nahkampfmesser was the standard issue German combat knife during the First World War. 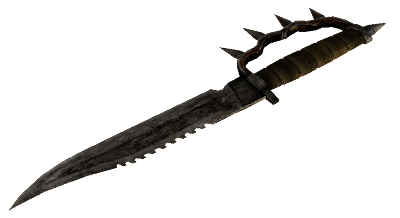 It remained in service in modified form through the end of the Second World War.Most of these knives had slab wooden grips and metal sheaths and were sturdily made. According to one authoritative source, German-issued trench knives of World War I were "...conventional, general-purpose, cut-and-thrust knives..." with blades that were "...for the most part approximately six inches in length, single-edged with a top leading false edge...although double-edged blades are occasionally encountered." 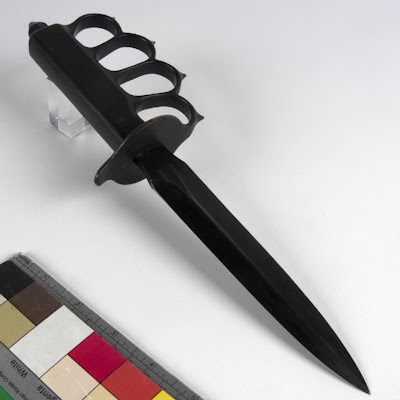 After the French Nail was employed against them, German forces on the Western Front also began to employ converted steel barbed-wire stakes into stabbing weapons for use by their own soldiers.